Some 50 settlers and right-wing activists entered a key West Bank military base. Story #1. Young, right-wing extremists in Israel rioted in Jerusalem and on a West Bank military base to protest the demolition of a couple of illegal hill-top settlements in the West Bank. The fact that there are literally hundreds of legal settlements beyond the “green line” (aka: 1967 borders) in which they could settle and make a stand on behalf of expanded Israeli borders upon the inevitable birth of the State of Palestine, obviously meant nothing to the violent insurgents. Filled with all the fury that religious righteousness and chauvinistic nationalism can induce, the yarmulke wearing thugs, in the name of God and their version of the truth, destroyed military vehicles on an army base and police cars in Jerusalem. Story #2. 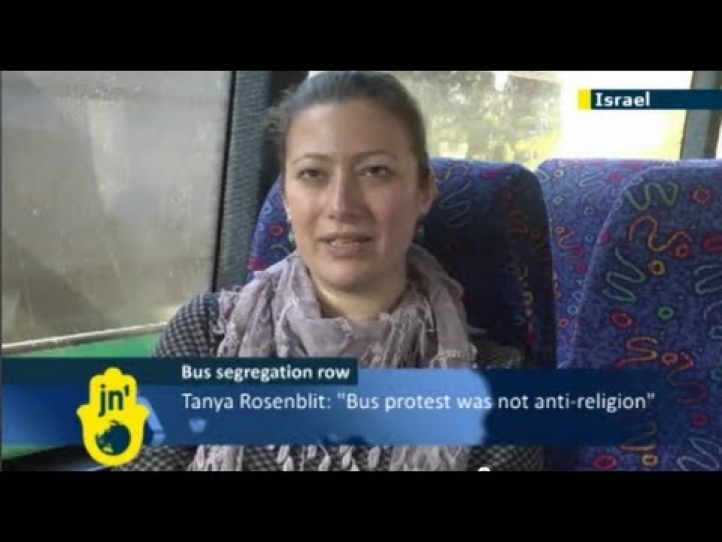 Tanya Rosenblit was acclaimed Israel’s “Rosa Parks” when she refused the demands of an ultra-Orthodox (aka: haredi) man to move to the back of the bus where women belong. Tanya was sitting on a bus bound from the City of Ashdod to Jerusalem when the “request” came. Upon refusing, the haredi man used his cell-phone to call in reinforcements. In a matter of moments, the bus was surrounded by haredim screaming about modesty and gender separate sitting. The altercation only came to an end 30 minutes later when the haredi gave up and left the bus. Story #3. The fear and trembling of an 8-year-old, Naama Margolis of Beit Shemish, touched the hearts of the people of Israel like no other child has in recent memory. In an interview with an Israeli TV reporter, Naama recounted how she was called a “whore” and was spit upon by one or more haredi men while she walked the 300 feet from her home to school. Why did Naama deserve such public humiliation? Because the Orthodox girl was not dressed as “modestly” as her attackers desired. Since the incident, Naama has been unable to walk to school without hysterics, even with her mother holding her hand. At the time, I penned a column in which I suggested that some residents of Israel obviously lacked the intellectual sophistication and emotional maturity to live in a pluralistic democracy. I compared the behavior of such religious and political extremists to those of the immature spouse who, unable to share power and decision-making with another human being, resorts to violence and intimidation in order subjugate his/her spouse. Since then, Israeli politicians of every stripe and religious leaders from across the spectrum have condemned Israel’s burgeoning, increasingly violent, lunatic fringe. Thousands of Israelis, many Orthodox themselves, marched through Beit Shemesh to protest the vulgar defamation of Judaism by fanatics who believe that it is OK to humiliate and frighten anyone they deem sinful, even an innocent little girl. Before I share some reflections about this protest, a few words about my own personal history. Were it not for the decisive courage of my maternal grandparents to flee Germany in 1938, I would not be here today. I myself lost dozens of cousins, aunts and uncles in the Shoah. My first and middle names were given to me in memory of an uncle and aunt who found their end in Nazi death camps. My relatives, your relatives, were forced to wear the “Jude” Jewish star in the slave-labor and death camps to indicate that they were, by Nazi standards, inferior beings to be treated like vermin. Since its inception, the Israeli government and society has tolerated the presence of religious fanatics who refuse to recognize the Jewish state; who refuse to serve in its military; who refuse to contribute in any way to the well-being and welfare of the people and State of Israel. But they are most certainly familiar with what government medical and social services are at their disposal. 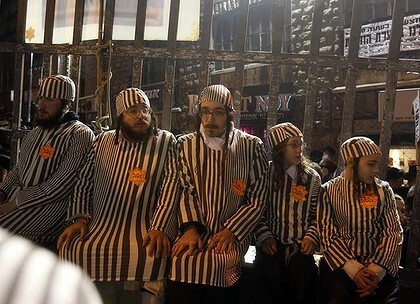 I recognize that not all the Hasidim in Israel put on the yellow Jewish stars last Saturday night. 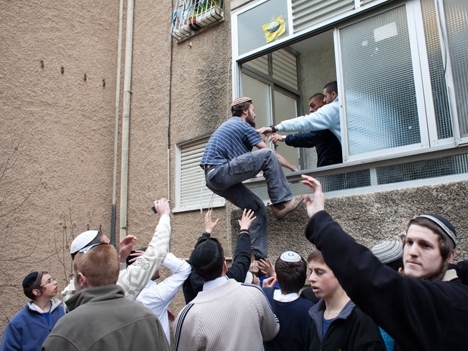 I acknowledge that there are many haredi Jews who tolerate, if not actually respect their less religious neighbors. That said, those people who chose to make a political statement by defaming the memory of the 6,000,000 saintly Jewish souls sacrificed on that altar of hate, cannot by any standard be identified as members of the House of Israel. These people are not Jews. They are members of dangerous cults who have less of a historical and political right to live in the Jewish State of Israel than the Palestinians who were displaced in the War of Independence. 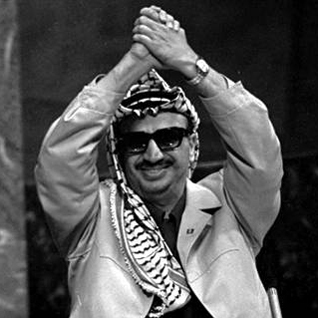 In 1974, the UN invited Yasser Arafat to address the General Assembly. The kafia wearing terrorist, with a gun hanging from a holster, was greeted at JFK airport by a group of hasidim that included representatives of the fanatical anti-Israel Neturei Karta and Satmar sects. It was and is my belief, that anyone who treats a murderer of Jews as a hero, cannot be a Jew him or herself. As such, I long ago stopped accepting the hashgacha (kosher certification) of the Satmar sect and I certainly do not patronize their businesses (e.g. Meal Mart). There are certain lines of civility and decency that every person must establish for him/herself. Those “people” who would accuse the Jewish community or the people of Israel of treating them like the victims of the Holocaust, surely crossed a proverbial line. As such, they are deserving of nothing less than our contempt. In recent months, the Israeli government has felt compelled to make a special effort to stem the flow of hungry, job-seeking illegal immigrants entering the country from tormented regions of Africa such as the Sudan. I can’t help put wonder if such refugees might be more appreciative, more productive citizens of the Jewish State of Israel than those religious and political fanatics who so frequently prove themselves unsuited for civilization.